When I lived in Washington state, it was like a religion. Everyone thought it was wonderful and great and expected you to agree. If you didn't, you would be seen as weird and negative. Seattleites got defensive if you had negative things to say about their beloved land. But the reality is that there is a "Seattle Freeze" that affects the social environment which makes it hard to make friends and connect with others. Simply put, people were very polite, but distant and non-inclusive. They didn't like to connect with others or meet new people. The motto was "Have a nice day. Somewhere else." Yet if you were not allowed to complain about this. If you did, Washingtonians became defensive and condemning, telling you that you're the only one who thinks that and that everyone else loves Washington. They refused to hear any evidence to the contrary. 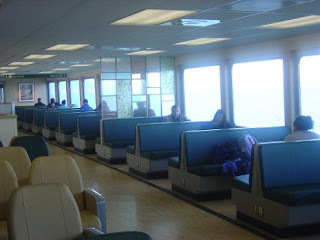 I even have some photos that show this "Seattle Freeze" in public, taken aboard a Seattle Ferry. Notice how everyone is isolated in their own bubble, wanting to be alone, not needing any social interaction. Obviously, this is not the right environment for an extrovert. Now, contrast that with these photos I took during a ferry ride in Riga, Latvia (in Eastern Europe). Even though the ride was in the late afternoon, people still knew how to party and dance. 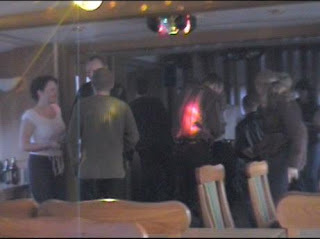 Here you see a mini-disco lounge on board the ferry being enjoyed by the passengers. This "freeze" is an intrinsic part of the Pacific Northwest in general, not just Seattle. People are just reserved, ghost-like and introverted. It is one of the hardest places in the world to make friends or get dates. Now the GOOD NEWS is that I have an easy solution to it. It involves not only leaving the Northwest, but the country altogether! Doing so works wonders and changes your universe! Just look at all these testimonials. See here in pictures of how my dating life went from zero to abundance overseas. And also see my Dating Abroad slide shows. Visit my website to learn more, and to learn that the problem is NOT you, but the society you live in! 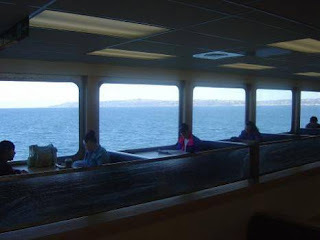 I have heard that the Pacific Northwest has the most unfriendly and anti-social people in the US. I have also heard guys say that the women who live there are fat and as ugly as sin! Thank God I don't live there! However there are also a lot of fatties and uglies where I live as too! Portland is the same. I cannot wait to leave this backward, unfriendly dump of a city. Oregon is a place for people who don't like people. I live in the Pacific NW and I'm not fat and ugly. When I was in my 20s and 30s, I had plenty of friends in Seattle. That was in the 1980s and generally I felt that people were friendly. Then the high-tech companies came in and everything was about making money and the vibe became more introverted, cold and distant. But to generalize about all of Seattle, is unfair. Not everyone fits that stereotype. I'm glad you found happier people abroad. But you'll never find Utopia. Everywhere you go, you will find fault with the people, eventually. I live in Estonia and am from Vancouver, BC. People are friendly and chatty Eastern Europe if they are drinking. They are actually quite antisocial. It doesnt bother me since im an also quiet. Glad i left Vancouver. Im also Estonian but Canadian born. Never fit in North America. No place on earth is an Utopia.